Earlier this week I promised to feature a recipe from my favorite new cookbook, “Prune”. I decided to make a cocktail, the Italian Greyhound, to showcase the height of citrus season here in Southern California. 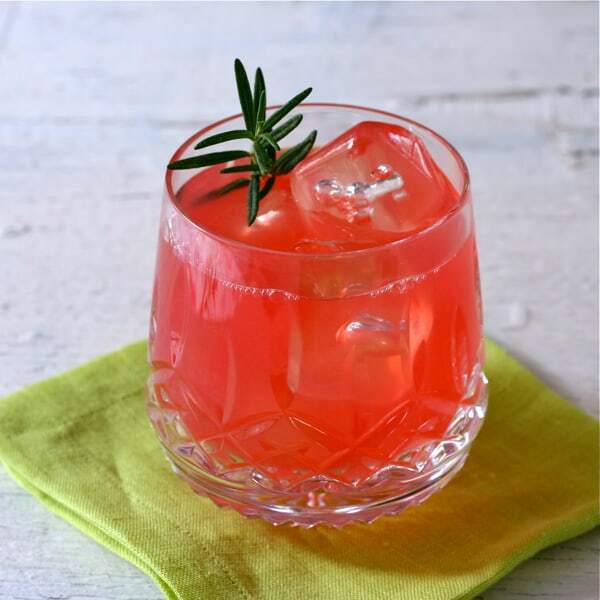 We had a pink grapefruit in the kitchen fruit bowl, so I used that and picked a sprig of rosemary from the garden. TIP: It took me a long time to finally invest in a one-ounce measure, what I call a “jigger”. Come to think of it, our friend Jan gave us hers. It certainly makes a more precisely measured cocktail. Pour the grapefruit juice, vodka and Campari into a cocktail shaker. Add ice and shake vigorously for 30 seconds. So simple, so luscious looking. A perfect Friday post! Cheers! I love this and am a big Campari fan, I think the Grapefruit compliments the Campari beautifully. I like it muddled with lime and sugar and then pour some soda water over it. So good!! Love the addition of Campari here!! Pinned! I always have all these ingredients on hand!!! Also, I started an cocktail/anything alcohol linky party on my other blog, Grey is the New Black -http://www.greyisthenewblack.com/gin-fizz-tropical-tipsy-tuesday/ I would love it if you link up! It will be every Tuesday and it’s called Tipsy Tuesday. Thanks for the invite – I don’t usually post a cocktail every week but have a few on ice. Hope you try it, Ani – and I have those Meyer lemons for you any time. Liz, another beautiful cocktail! You inspire me to break free from our usual cocktail rut and try something new. We’re so lucky to have such great citrus in San Diego! Thanks, Lisa – it’s fun to try something new, especially if it’s pretty. What a stunning color this cocktail is!! Neither Myles nor I are big drinkers of hard alcohol, but this drink might change our minds. I’ve seen the cookbook Prune in all the stores – it sounds like you really like it!! “Prune” is a fabulous cookbook and such an original style to it – would love to visit her restaurant. I tried Campari for the first time this summer in Italy. I’m not sure it’s my favorite, but I LOVE a good Greyhound, and this one looks so pretty-I definitely have to try it! I, too, have a long way to go regarding appreciating Campari, but it is SO pretty. I’ve always struggled a bit with Campari; a Negroni has never been a favorite of mine. But a splash? That I could do because it sure does make a drink beautiful. Have you ever tried Aperol? I call it Campari Light…similar and made by the same company but much less herbaceous and bitter. Amazing coincidence, Barb – just home from the grocery store, having noticed Aperol and wondering what I could make with it – honest!